Now that both of my little guys are bring projects home from school I wanted a prominent place to put their work on display. 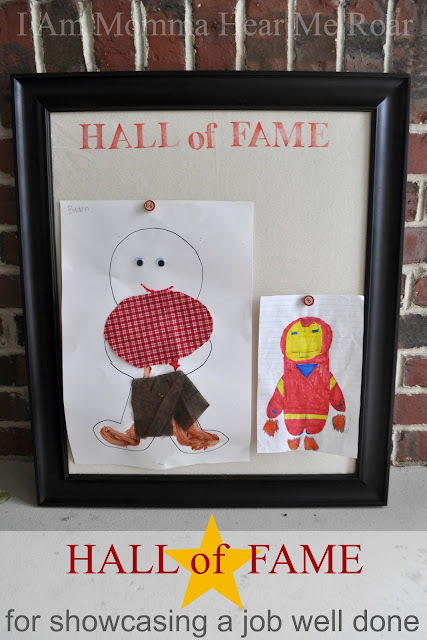 So, I made this "Hall of Fame" board so we can hang those cherished items for a while. I purchased a bulletin board first. And then I cut some fabric to cover the bulletin board - just to give it a more finished look. After ironing the fabric I used a little bit of Aleene's Tacky Spray to attach the fabric to the bulletin board and then I tucked the edges of the fabric into the frame with a butter knife. Then I used the new Scribbles Fabric Stamp Pads and the Scribbles Alpha Stamp Kit to write "Hall of Fame" on the fabric. Now it's ready to hang anything special. Wow! Your creations are amazing!